You are here: Home / I am a Reluctant Landlord / Why a Rent Increase is a GOOD Thing! 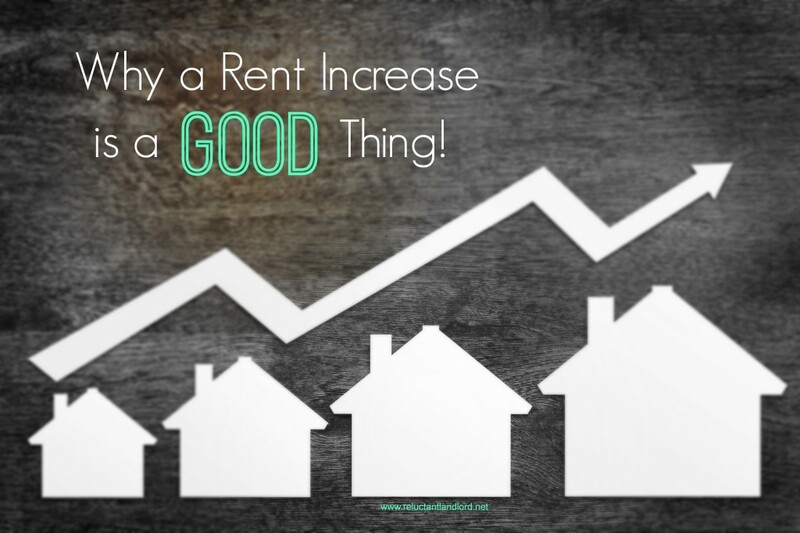 Why a Rent Increase is a GOOD Thing! It’s Official: I am that horrible landlord that does a rent increase on great, long-term tenants at renewal time. Contrary to public opinion, it’s not because I am a money-grabbing landlord. The market is very fickle and it’s always planning for your demise through expenses and market caps. While the actual mortgage that a landlord pays (principle/interest) never changes. The escrow fees, taxes and insurance do change. Taxes. Everyone loves when the house appreciates (gains in value). What people don’t realize is the taxes for most states/areas are directly related to the market value of the house. So when the house increases in value so does the tax and then your mortgage payment. Insurance. Insurance is based on numerous variables. Insurance premiums are based on the cost for replacement. The two biggest “influencers” are inflation and risk. If a natural disaster occurs, everyone’s insurance increases because the risk for your area has increased. The other biggest influencer is inflation, as the replacement cost is another “metric” for determining the cost of insurance. As the cost to replace your house increases (material and labor) so does your premium. Random things that you didn’t know existed until they no longer function. These all cost money. The way you pay for these costs is through cash-flow. Unfortunately your cash-flow is determined primarily by the market. You can only charge what people are willing to pay. On the other hand, it is important to research what other people are charging because you ALWAYS get someone who tries to negotiate. This is why it’s important to know when to stick to your price and when to compromise. At the end of the day an empty property is not helpful. The biggest mistake a landlord can make is NOT doing a rent increase when the house comes up for renewal. We do not offer discounts to long term rentals. Our “discount” is the fact that the value is locked in and we will not raise it. When you decide NOT to do a rent increase you are doing yourself and your tenants a disservice because not increasing the rent often times causes bad landlording. Typically do not make huge amounts of money. Remember: your expenses are increasing, but your rent is not. Sell as soon as they see appreciation. This often means kicking tenants out because it’s not “worth” it. Lack funds for upgrades and repairs. No increases = smaller margin to upgrade the home. Causing it to either not happen(creating a vicious circle because now it is less desirable for future rental) or coming out of pocket creating a drain on the landlord. So far our feedback from our tenants have been very positive. We are able to take care of the houses because they produce money. They produce money because we preserve the margin by maintaining the houses at market value. It is important to maintain ALL the houses at market value because not every house in the portfolio will always equally pull it weight because the market isn’t “fair”.